In a significant decision, the Allahabad High court has turned down the writ petition filed by the Petitioner asserting a right that a screening test should be held for assessing the validity of the postgraduate qualification obtained by her from Nepal under Section 13(4A) of the MCI Act, 1956. The division bench of Allahabad High Court (ACH), in Dr. Astha Midha vs. Union of India, Through MHRD and others, held that Section 13(4A) is not attracted to the postgraduate qualification of the petitioner from Nepal, once she has been enrolled on the State Medical Register. The postgraduate degree qualification which is obtained by the petitioner is not a recognised medical qualification within the meaning of Section 12 or Section 13 of the Act and therefore, the petitioner has no right to assert for Screening Test. Speaking for the Court, Dr. D.Y. Chandrachud, CJ. 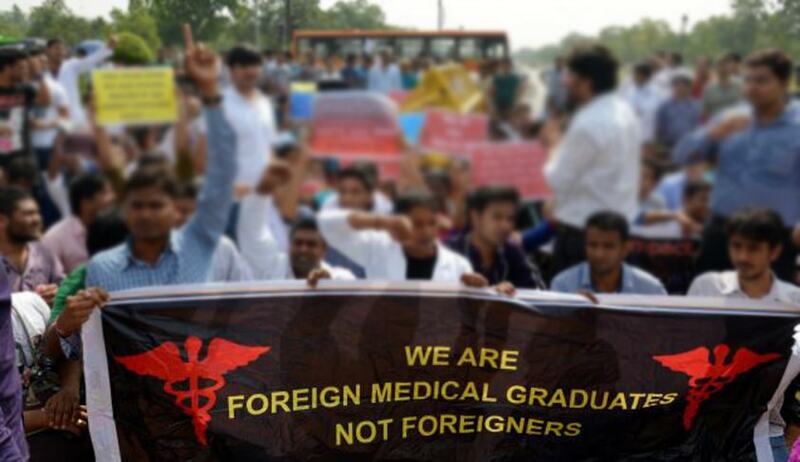 said that the object and purpose of a Foreign Medical Graduate screening test is not to recognise an additional medical qualification which is obtained by a student after being registered on the State Medical Register or as the case may be after his or her name is entered in the Indian Medical Register. Once the student on the strength of a medical qualification which is obtained from an institution situated outside India has appeared at the screening test and upon qualifying the screening test has been enrolled on a State Medical Register or, in consequence, has been entered upon the Indian Medical Register, the purpose of the screening test is duly met. Section 13(4A) does not apply at a stage where the person who is already enrolled on the State Medical Register obtains an additional qualification in terms of a postgraduate degree from an institution abroad. The court also referred to the Apex Court’s Judgement in Yash Ahuja and Ors. vs. Medical Council of India, for upholding the Validity of Screening Test for Foreign Medical graduate as stipulated under S 13(4A) of the MCI act and Regulation 3 of the Regulations of 2002. This Judgment of AHC becomes significant because every year FMGE (Foreign Medical Graduate Examination) is conducted twice by National Board of Examination as a screening test for testing the quality of Foreign Medical Graduates. The pass percentage is however very low, viz is 10-12% and this has rendered more than 12,000 qualified Foreign Doctors jobless. An Association formed by these students alleges the interplay of corruption and biasness towards the Medical Council of India for not disclosing the question paper and OMR sheet of the Candidate. There is yet another planning of the Ministry of Health to introduce an Exit Exam on the line of FMGE for Indian Medical graduates in order to raise the standard of Doctors entering the healthcare professionalism.